The raw milk wars are heating up again. Raw milk is illegal in New Jersey, so many people who wish to drink pure, unadulterated raw milk direct from the farm, need to cross state lines into neighboring states in order to obtain it. 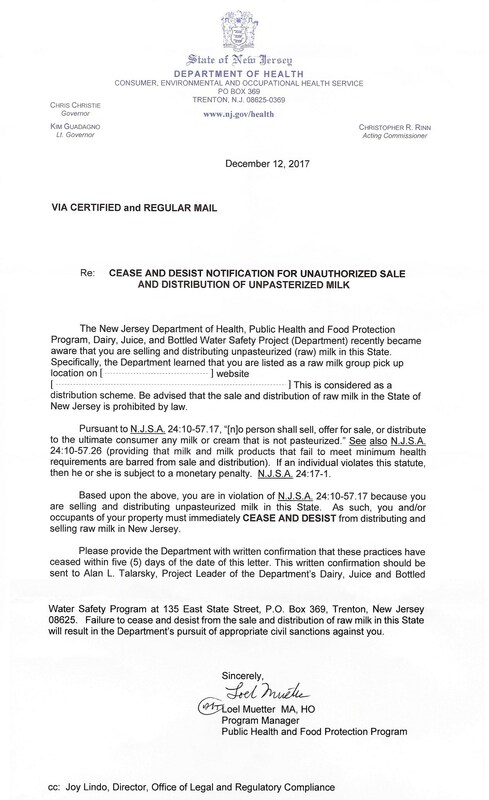 Not satisfied apparently with restricting the production, sale, and distribution of raw milk in New Jersey, state regulators, allegedly backed by the powerful FDA, are going after citizens in New Jersey for mere possession of the banned substance. Furthermore, they are apparently targeting immigrants in the state, mainly from India, where raw milk is a big part of their culture and cuisine. Terrified citizens of New Jersey today fear fines and possible civil action simply for possessing raw milk. Food activist David Gumpert blogged about the recent action in New Jersey, as he has been in contact with some of the citizens who are being threatened. It’s highly unusual for food regulators in a raw milk enforcement crackdown to visit private homes and threaten consumers. Within the last two weeks, at least one investigator from a New Jersey health authority has visited private homes in at least four towns that serve as drop sites for private food clubs, taking photos of food coolers and warning consumers they could face fines or other legal penalties, presumably for using their homes as pickup points for raw dairy and other food for their local neighborhoods. However, it was not much longer before Gumpert found out just what they were up to: terrorizing local citizens for transporting raw milk into New Jersey from a neighboring state. Copy of threatening letter sent to residents of New Jersey who were allegedly carrying raw milk into the state from Pennsylvania. Image courtesy of David Gumpert. The letters are signed by Loel Muetter, program manager of the Public Health and Food Protection Program. So why is New Jersey targeting its residents and spending tax payer resources to go after a few people bringing raw milk into their state? While food regulatory agencies, such as the FDA, would like to convince the public that raw milk is dangerous and is a public hazard, nothing could be further from the truth. As our info-graph at the top of this article illustrates, food-borne illnesses that end up killing people are most common in raw produce, and raw chicken – raw foods that are perfectly legal and found in your local supermarket. 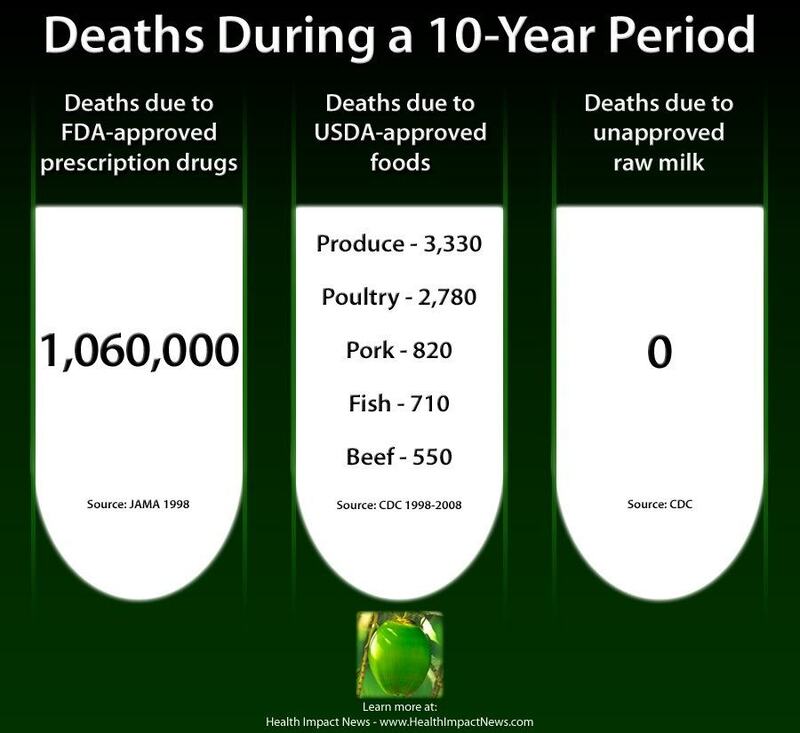 There are no records of anyone dying from drinking raw milk in the U.S. for the past 50 years or so. Sales of raw milk are generally legal in other parts of the world, and in places in Europe you can even purchase raw milk in vending machines. The real reason government agents are sent to try and intimidate raw milk producers and consumers is that direct to consumer milk sales from dairy farmers threatens Big Dairy, and their massive subsidies that keep milk prices low. In 2011 the fight against raw milk drew national attention with the FDA sting operation against Pennsylvania Amish raw milk supplier Dan Allgyer. Allgyer was working with buyer clubs in Maryland and Washington D.C. to allow them to receive deliveries of raw milk and other farm products. The battle lines were being drawn between consumer rights and government regulatory officials over the purchase of direct-from-the-farm pure raw milk. The nation’s largest seller of organic milk, Organic Valley, soon weighed in on the issue, and issued a statement preventing their co-op members from selling raw milk direct to consumers. The reason was NOT because the leaders of Organic Valley viewed raw milk as dangerous, many of them were dairy farmers and drank raw milk themselves, it was purely for economic reasons. When organic milk producers commit to so much volume of milk, and then fail to meet their contractual obligations to supply that much milk, it hurts businesses who rely on producers to supply enough milk into their “milk pools” that go into producing dairy products. He said Organic Valley has confronted a growing problem of milk “diversion”–raw milk that doesn’t make it onto Organic Valley trucks for processing because it’s being sold unpasteurized, or else used for making cheese, butter, and other products. Both men indicated that the raw milk issue was the most divisive in the cooperative’s 23-year history. But they also made clear that the decision was a business decision, having little or nothing to do with raw milk’s perceived risks or the wishes of regulatory authorities. They noted that probably all Organic Valley’s directors and executive board members are raw milk drinkers. Hence, small-scale dairies who provide a superior milk product that is both healthy and safe face a dilemma: if they sell directly to the consumer at prices much higher than what Big Dairy will pay for their milk to be added to their milk pools, they risk losing their business to large milk wholesalers. So unless they can direct-market their entire milk supply to consumers, something very few dairy farmers can do, they are forced to sell their entire milk supply into the commercial milk pools. Which is exactly what Big Dairy wants. This has nothing to do with raw milk hazards or public health. When such a healthy product is cut off from consumers, there will naturally be push-back from consumers. Imagine a hard-working mother trying to raise her children in healthy ways who discovers that a local dairy farm supplying pure, unadulterated milk directly from the cow before being processed, results in better health for her children, including eliminating allergies, and then finds out she can no longer purchase that milk because bureaucrats tell the public such a product is dangerous. Such consumers are rapidly increasing in the U.S. today, and they have done their homework, realizing that raw milk from small-scale producers is a product that has been in the food chain for thousands of years, and is largely available in many countries outside the U.S.
Today, one of the leading advocacy groups fighting for consumer rights to choose their own food including raw milk, is the Real Food Consumer Coalition (RFCC). RFCC was conceived through conversations with a new real food (raw milk) consumer after he learned about Amos Miller’s troubles with the USDA. Said consumer, a past Tribal Leader who specializes in Native American Tribal and water issues on the west coast, suggested to Liz Reitzig that a labeling scenario could be the ideal ice-breaker in opening up interstate raw milk sales. Not perfect, but progress. Ms. Reitzig, an accomplished and outspoken raw milk activist , quickly approached other leading raw milk advocates and core organizers to establish a coalition based on the fact that consumers need to be represented and protected as well. Also, many Amish and small family farmers are not allowed to have legal representation, or can not afford it. RFCC already has a petition in place that would solve the problem these residents in New Jersey are facing here at the end of 2017. In 2011, I spearheaded the Raw Milk Freedom Riders (RMFR) because consumers and raw milk advocates were frustrated with the FDA’s draconian enforcement measures and policy to investigate, spy and raid the milk producers who were delivering fresh nutrient dense raw milk across state lines. A close circle of raw milk advocate/activist friends and I organized the first Freedom Riders event (as you were first to report David) on November 1, 2011. The RMFR (a caravan of raw milk procuring moms) transported fresh milk from Pennsylvania into Maryland and then proceeded to join the RMFR rally in front of the FDA headquarters in Silver Spring Maryland where we distributed and enjoyed delicious raw milk and cookies. The Farm Food Freedom Coalition (F3C), which I co-founded, continued to ask the FDA for dialog on the above matter in order to meet the needs of the thousands of consumers fighting the government for their right to choose and procure this healthy food against the FDA’s ongoing policy, and government overreach. Further, I helped create RFCC when the USDA was pursuing charges against Amos Miller’s buying club (Miller’s Organic). RFCC, in conjunction with PA attorney Joseph Macaluso, worked to keep all consumer information away from the courts and the agencies and was instrumental in finding a peaceful resolution to Amos’ contempt of court charges. Thus, protecting both consumers and farmers from overzealous regulations and the regulators tasked with enforcing those regulations even when it means targeting their own community members. RFCC was victorious in representing Amos and negotiating the contempt conditions, has delivered probably the most realistic plan for reducing abusive enforcement through our Citizen’s Petition with the law firm Emord & Assoc., and we are now fighting to help the consumers in NJ. The FDA is using a bottom-to-top strategy to isolate individual consumers and to circumvent the RFCC Citizen Petition and go after another farmer in their aggressive overreach to protect big corporations and destroy small farmers. Currently, no raw milk farmer is safe. Yes, it is time to again challenge these laws and regs. The petition remains the best means to do so, along with a concerted political campaign to change the law and repeal the interstate ban entirely. Along with that, we must insist on public scrutiny of the FDA’s role in enforcement and collaboration in destroying the lives of peaceful Americans and America’s guests. The FDA is relentlessly pursuing their agenda to shut down raw milk production and consumption. Ultimately, they will not do that. But it is up to us to act proactively prevent the further loss of life and liberty for our community members–whether they are Americans or our honored guests. Support the RFCC petition here. I would encourage all NJ raw milk drinkers, along with everyone in the state who supports food rights, to contact their state reps, and protest this aggressive enforcement behavior. The state legislators control the budget of the NJ Department of Health, and thus have more influence than anyone else on its behavior. Subscribe to David Gumpert’s blog here.